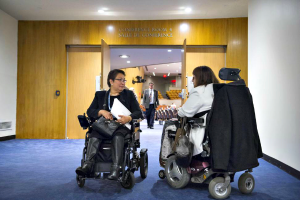 The UN Programme on Disability/Secretariat for the Convention on the Rights of Persons with Disabilities (SCRPD) falls within the Division for Social Inlusive Social Development (DISD) of the United Nations Department of Economic and Social Affairs (UNDESA). Our global mission is to promote the rights and advancement of persons with disabilities within a broad mandate provided by the World Programme of Action (1982), Standard Rules (1994) and the Convention on the Rights of Persons with Disabilities (2006), as well as other relevant human rights and development instruments. Co-chair the United Nations Inter-agency Support Group on the Convention on the Rights of Persons with Disabilities (IASG). More information: Email us enable@un.org or via our Contact us page.